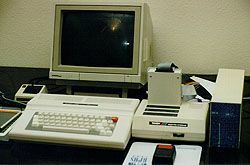 History : 11/15/96 : Acquired a 128k Coco 3 for $26.00. 03/? ?/97 : Acquired a 512k Coco 3 with LOTS of stuff. 07/15/98 : Acquired Coco 3 for $3.03. 08/15/98 : Acquired Tandy Deluxe Joystick for $1.50. 12/29/98 : Acquired CM-8 RGB Monitor for $9.09. 02/00 : Acquired Coco 3, disk drive and lots of doc and software for the cost of shipping. 06/21/00 : Picked up FD501 drive and controller for $1.51. This is a final model of the TRS-80 Color Computer. I have a second Coco 3 with 128k ram. I have a bunch of new Coco items which I'm sorting through. I'll update things here as I sift through it. If you have stuff to get rid of for a Coco 3 or OS/9 drop me a note. Also check out my Coco Library. I could use some help locating a cable for the Coco to CM-8 or the pin outs for the rgb connector on the Coco and the connector on the CM-8 so I could build one.